Online poker is great, but sometimes you want to take a break from sitting in front of your computer and get outside. Well, from next week Juicy Stakes Poker will give players the chance to leave their laptop behind and go on the trip of a lifetime, as daily satellites to September's Caribbean Poker Cruise begin. From just $2.20, you can take the first step on a journey which ends with a seven-day cruise around the Caribbean Sea, taking in exotic ports in Haiti, Jamaica and Mexico. 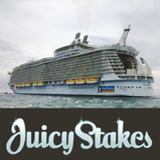 The $3,500 top prize includes a week aboard the Allure of the Seas cruise ship as it sets sail from Fort Lauderdale, plus a $1,100 Card Player Poker Tour main event entry and the chance to play cash games and tournaments on the luxury vessel. Cash games and tournaments will be running all week on the Allure of the Seas, which leaves Fort Lauderdale on September 7th(except for when the ship is docked). And if that's a bit far away for your liking don't worry - Juicy Stakes is throwing in $500 in travel expenses as part of the deal, to help you get to and from the Floridian city. This is the perfect time to open an account with Juicy Stakes Poker - as well as the chance to win a place on the cruise, all new players are eligible for a 200% first deposit bonus up to $1000. Bon voyage!